Downsizers are the mainstay of the country-house market these days, but most homeowners of ‘a certain age’ will admit that the decision to finally up sticks and move is one of the most agonising they are ever likely to make. Especially when the house involved is an architectural gem, which has been in the family for several generations. For Hugh St John-Mildmay, the decision to sell Grade II *- listed Drakestone House at Stinchcombe, Gloucestershire -through Hamptons International in Cirencester (01285 654535) at a guide price of £2.25 million -is made all the more poignant by the fact that Drakestone is the last of a vast portfolio of houses and estates accumulated by his ancestors, which, for one reason or another, has gradually ‘dwindled away’ over the years. The classic Arts-and-Crafts house was built by the owner’s grandparents, Walter and Mabel St John-Mildmay, both talented artists and fervent admirers of the Arts-and-Crafts movement. The couple contributed much to the interior design of the house, including the delicate mouldings of the ceilings. The original scheme for Drakestone, as conceived by Ernest Gimson in 1908, was an altogether grander affair, which envisaged the creation of ‘the largest thatched house in England’. But the costs were prohibitive and a scaled-down, more practical version, built of Cotswold stone under a slate roof, was eventually completed in 1911 by the architect Oswald P. Milne. Milne was a former pupil of Sir Edwin Lutyens, whose influence- and that of Lutyens’s patron and collaborator Gertrude Jekyll-is evident in the design and layout of the house and gardens at Drakestone. Although perhaps best remembered for his striking redesign of the lobby and staircase at Claridges in 1929, Milne had a reputation for ‘careful, craftsmanly design and good management’- qualities that were also his mentor’s stock in trade. Lutyens, he says, ‘had a wonderful way with clients. He was marvellous not only in dealing with materials but in dealing with human beings. He always got them to spend what he wanted them to spend’. Writing in Country Life in 1919, the magazine’s architectural editor, Lawrence Weaver, cites Drakestone House as ‘a good example of the success which comes from the right handling in the simplest way of materials beautiful in themselves’. It is Drakestone’s simplicity that Mr St John-Mildmay and his wife, Crystal, also found appealing when, in 1975, they moved there on returning from Africa, where Mr St John-Mildmay worked for the British Council. 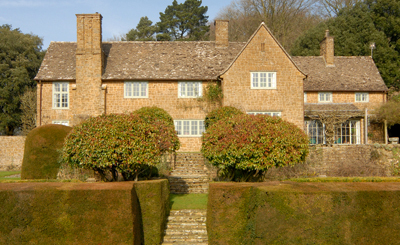 It’s also the reason why, apart from enlarging the kitchen and general decoration and maintenance, they have seen no reason to change the house, described in its 1984 English Heritage listing as ‘a very splendid and restrained example of the Cotswold Country House style of the period, virtually unaltered’. For sale for the first time in its 102-year history, Drakestone House stands in a glorious position high in the hills between Dursley and Stroud, looking south-west across the Cotswold escarpment to the Severn Vale and the Black Mountains in the distance. Protected by about 10 acres of gardens and paddocks beneath a bank of well-established woodland, Drakestone has some illustrious near-neighbours, including the Grade II*-listed Georgian Piers Court, home to the writer Evelyn Waugh from 1937 to 1956. With its three main reception rooms, pretty garden room, large kitchen, six bedrooms, four bathrooms and various ancillary rooms linked by staircases at different levels, Drakestone House is a delightfully quirky but ‘incredibly manageable’ house, which its devoted owners will be very sad to leave. Advancing years are also the reason why brothers John and Robin Blain have decided to sever their family’s longstanding connection with historic Melbury Bubb Manor, near Dorchester, Dorset. 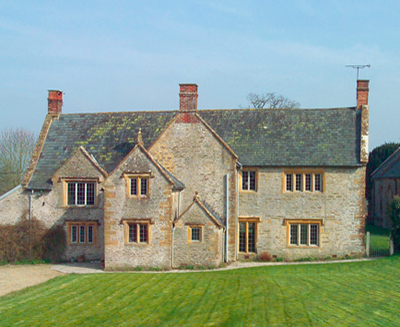 Chesterton Humberts in Sherborne (01935 812323) quote a guide price of £2.25m for the early-17th-century stone manor house with a range of farm buildings, a farmhouse and some 150 acres of grounds, pasture and woodland as a whole, or in six lots, with the manor house and 60 acres of land on offer at £1.225m. Most of the farmland is let on a Farm Business Tenancy to a local farmer. Melbury Bubb Manor, which sits in rolling countryside at the western end of the Blackmore Vale, was held, after Domesday, by the Bubbe family and then by a succession of owners, before being sold in the late 15th century to the Foye family, who are thought to have built, or rebuilt the later part of the house. In 1784, following the death of the last male heir, the manor passed to his younger sister, and was sold as a tenanted farm to the nearby Ilchester estate in 1883. The estate, in turn, sold it to Commander and Mrs Maurice Brind in 1924. In 1935, Melbury Bubb Manor was bought by the present owners’ father, Maj Thomas Blain, who fought in the First World War as a captain in the Lancashire Fusiliers, seeing action at the Somme and elsewhere in France and Belgium, for which he was awarded the Military Cross. He and his wife both loved their hunting and then, as now, the Blackmore Vale was hunting heaven. Maj Blain died at Melbury Bubb in 1971, but his widow lived on at the manor until her death, two years ago, at the age of 104. Built of mellow natural stone with mullioned, leaded-light windows under a slate roof, Melbury Bubb Manor has been re-roofed but needs further modernisation. It ‘exudes the atmosphere, character and charm associated with a house of this age… yet boasts excellent ceiling heights throughout, with all rooms having splendid views of the garden, the medieval church, the hills and woodland at the rear and the rolling farmland surrounding the village,’ say the agents. The accommodation is versatile with two staircases-one at either end of the house-and a central hall running from front to back, and includes three reception rooms, a kitchen, six bedrooms and two bathrooms.